The Republican-controlled Senate on Wednesday failed to get an enough majority to override President Barack Obama's veto of Keystone XL pipeline. The vote was 62 to 37, failing to reach the two-thirds majority required to undo a presidential veto. The failure in the Senate means the House of Representatives will not vote on override. The US Senate will likely vote on the Keystone XL Pipeline bill next week before advancing it to US President Barack Obama’s desk for approval, Republican Senator from North Dakota John Hoeven said, following the president’s State of the Union speech on Tuesday. The Republican-controlled House approved the Keystone XL oil pipeline easily on Friday, ignoring the recent veto threat against this project from US President Obama. 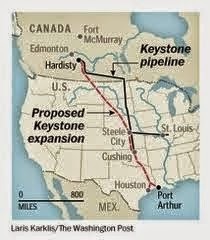 The House passed the project by 266 votes to 153, the tenth time that the chamber has passed the pro-Keystone legislation. The Senate is set to consider the legislation next week.